The RR-130A37SP low profile Roller Ratchet® with built-in 3/8'' hex socket replaces the RWB130A37. The zero backlash Roller Ratchet® with 3/8'' integral hex socket and thru-hole for hex key installs Hi-Lok® and Hi-Lite® collars in close quarters. Maximum torque rating is 250 lb-in. 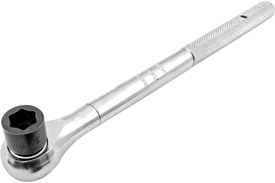 Roller Ratchets® from Omega Technologies were developed in response to the need for very small ratchet wrenches that could be used in extremely tight spaces where handle 'swing' was limited by obstructions, and the need to have a ratchet that would engage with very little handle movement. The Roller Ratchet® satisfies both of these requirements, and this modular tool is now widely used in the aerospace community worldwide. Roller Ratchets® is a registered trademark of Omega Technologies, Inc.
Low Profile Roller Ratchet with built-in 1/4'' hex socket. Replaces RWB130A25. Zero Backlash Roller Ratchet with 1/4'' Integral Hex Socket and Thru-Hole for Hex Key. Low Profile Roller Ratchet with built-in 5/16'' hex socket. Replaces RWB130A31. Zero Backlash Roller Ratchet with 5/16'' Integral Hex Socket and Thru-Hole for Hex Key. Low Profile Roller Ratchet with built-in 11/32'' hex socket. Replaces RWB130A34. Zero Backlash Roller Ratchet with 11/32'' Integral Hex Socket and Thru-Hole for Hex Key. Low Profile Roller Ratchet with built-in 7/16'' hex socket. Replaces RWB130A43. Zero Backlash Roller Ratchet with 7/16'' Integral Hex Socket and Thru-Hole for Hex Key. High Strength Low Profile Roller Ratchet with built-in 1/2'' hex socket. Replaces RWB250A50. Zero Backlash Roller Ratchet with 1/2'' Integral Hex Socket and Thru-Hole for Hex Key. Installs Hi-Lok and Hi-Lite Collars in close quarters. Low Profile Roller Ratchet with built-in 3/16'' hex socket. Replaces RWB40A18, and ZRDA80-18. 5.5'' OAL, Long Handle, Zero Backlash Roller Ratchet with 3/16 Integral Hex socket and Thru-Hole for Hex Key. Short Handl Low Profile Roller Ratchet with built-in 3/16'' hex socket. Replaces ATSK3539IT-3/16. 3.5'' OAL, Short Handle, Zero Backlash Roller Ratchet with 3/16 Integral Hex socket and Thru-Hole for Hex Key. Low Profile Roller Ratchet with built-in 7/32'' hex socket. Replaces RWB40A21, and ZRDA80-21. 5.5'' OAL, Long Handle, Zero Backlash Roller Ratchet with 7/32 Integral Hex socket and Thru-Hole for Hex Key. Short Handl Low Profile Roller Ratchet with built-in 7/32'' hex socket. Replaces ATSK3539IT-7/32, and ZRDA80-21S. 3.5'' OAL, Short Handle, Zero Backlash Roller Ratchet with 7/32 Integral Hex socket and Thru-Hole for Hex Key. Low Profile Roller Ratchet with built-in 1/4'' hex socket. Replaces RWB40A25, and ZRDA80-25. 5.5'' OAL, Long Handle, Zero Backlash Roller Ratchet with 1/4 Integral Hex socket and Thru-Hole for Hex Key. Short Handl Low Profile Roller Ratchet with built-in 1/4'' hex socket. Replaces ATSK3539IT-1/4, and ZRDA80-25S. 3.5'' OAL, Short Handle, Zero Backlash Roller Ratchet with 1/4 Integral Hex socket and Thru-Hole for Hex Key. Low Profile Roller Ratchet with built-in 9/32'' hex socket. Replaces RWB40A28, and ZRDA80-28. 5.5'' OAL, Long Handle, Zero Backlash Roller Ratchet with 9/32 Integral Hex socket and Thru-Hole for Hex Key. Short Handl Low Profile Roller Ratchet with built-in 9/32'' hex socket. Replaces ATSK3539IT-9/32, and ZRDA80-28S. 3.5'' OAL, Short Handle, Zero Backlash Roller Ratchet with 9/32 Integral Hex socket and Thru-Hole for Hex Key. Low Profile Roller Ratchet with built-in 5/162'' hex socket. Replaces RWB40A31, and ZRDA80-31. 5.5'' OAL, Long Handle, Zero Backlash Roller Ratchet with 5/16 Integral Hex socket and Thru-Hole for Hex Key. Short Handl Low Profile Roller Ratchet with built-in 5/16'' hex socket. Replaces ATSK3539IT-5/16, and ZRDA80-31S. 3.5'' OAL, Short Handle, Zero Backlash Roller Ratchet with 5/16 Integral Hex socket and Thru-Hole for Hex Key. Low Profile Roller Ratchet with built-in 11/32'' hex socket. Replaces RWB40A34, and ZRDA80-34. 5.5'' OAL, Long Handle, Zero Backlash Roller Ratchet with 11/32 Integral Hex socket and Thru-Hole for Hex Key. Short Handl Low Profile Roller Ratchet with built-in 11/32'' hex socket. Replaces ATSK3539IT-11/32, and ZRDA80-34S. 3.5'' OAL, Short Handle, Zero Backlash Roller Ratchet with 11/32 Integral Hex socket and Thru-Hole for Hex Key. Low Profile Roller Ratchet with built-in 3/8'' hex socket. Replaces RWB40A37, and ZRDA80-37. 5.5'' OAL, Long Handle, Zero Backlash Roller Ratchet with 3/8 Integral Hex socket and Thru-Hole for Hex Key. Short Handl Low Profile Roller Ratchet with built-in 3/8'' hex socket. Replaces ATSK3539IT-3/8, and ZRDA80-37S. 3.5'' OAL, Short Handle, Zero Backlash Roller Ratchet with 3/8 Integral Hex socket and Thru-Hole for Hex Key. Low Profile Roller Ratchet with built-in 7/16'' hex socket. Replaces RWB40A43, and ZRDA80-43. 5.5'' OAL, Long Handle, Zero Backlash Roller Ratchet with 7/16 Integral Hex socket and Thru-Hole for Hex Key. Short Handl Low Profile Roller Ratchet with built-in 7/16'' hex socket. Replaces ATSK3539IT-7/16, and ZRDA80-43S. 3.5'' OAL, Short Handle, Zero Backlash Roller Ratchet with 7/16 Integral Hex socket and Thru-Hole for Hex Key. Low Profile Roller Ratchet with built-in 1/4'' hex socket. Replaces RWB80A25. Zero Backlash Roller Ratchet with 1/4'' Integral Hex Socket and Thru-Hole for Hex Key. Installs Hi-Lok and Hi-Lite Collars in close quarters. Low Profile Roller Ratchet with built-in 5/16'' hex socket. Replaces RWB80A31. Zero Backlash Roller Ratchet with 5/16'' Integral Hex Socket and Thru-Hole for Hex Key. Installs Hi-Lok and Hi-Lite Collars in close quarters. Low Profile Roller Ratchet with built-in 11/32'' hex socket. Replaces RWB80A34. Zero Backlash Roller Ratchet with 11/32'' Integral Hex Socket and Thru-Hole for Hex Key. Installs Hi-Lok and Hi-Lite Collars in close quarters.